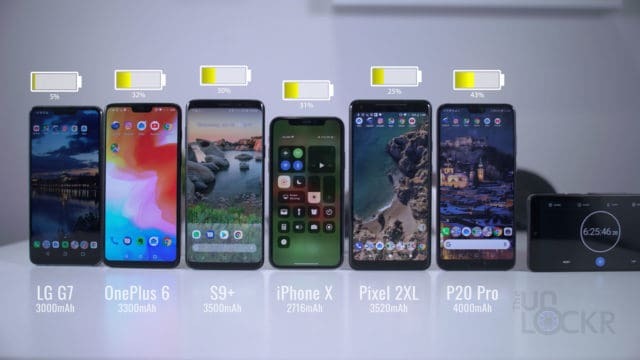 I have a feeling which phone will win (it has the biggest battery, and the company is known for making phones that refuse to die), but let’s find out. 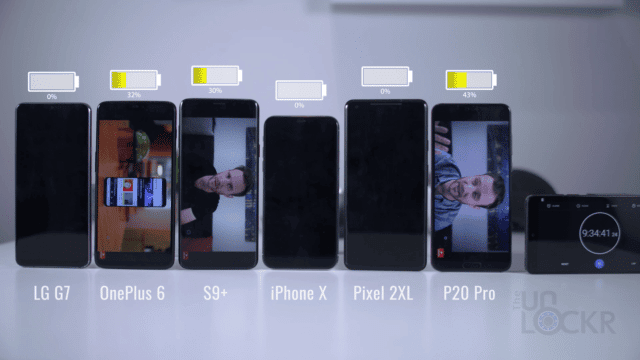 Today, we’re doing a battery test with the OnePlus 6, LG G7, Huawei P20 Pro, Samsung Galaxy S9 Plus, Google Pixel 2 XL, and the iPhone X to see which lasts the longest. Here’s the scenario. 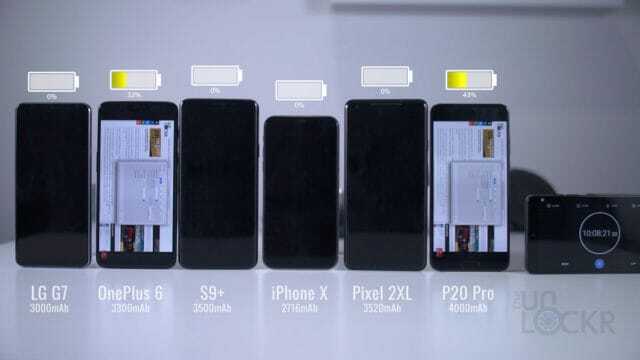 All phones screens are set to the same brightness by eye and not display percentage to account for the varying brightness each screen is capable of, they are all on the same 5Ghz WiFi network, and they all have the same social media, email, and other accounts loaded so they’ll all get the same notifications, same processes running in the background, etc. In this test, I wanted to try something a bit more realistic than my usual just running a YouTube video constantly so I’m going to try and mimic some different common activities we do on our phones (without me actually just using all 6 phones for 14 hours straight). So first, let’s play a video game for 30 mins and see what that does to them. After that, we’re all already in the low 90’s for the percentage of battery left with the iPhone X and Huawei P20 Pro ahead if only just at 94%. Now, let’s try and do an hour of Instagram by leaving it on the explore page (since it has a constantly running video and will possibly mimic an hour of social media use in general. Ok, after that, we’re starting to see a bit more of a split with the G7 falling a bit further behind here, the OnePlus 6, S9 Plus, and Pixel 2 XL, neck and neck at 83% and the iPhone X and Huawei P20 Pro at 87 and 86 respectively. I’m pretty sure the iPhone X jumping ahead a little here is because of all the phones it’s the only one whose Instagram app stops auto-playing the video after a certain amount of time, but let’s see what happens next. Let’s run Google Maps for 30 mins to mimic the amount of time you might use it in a day with GPS, etc. on. 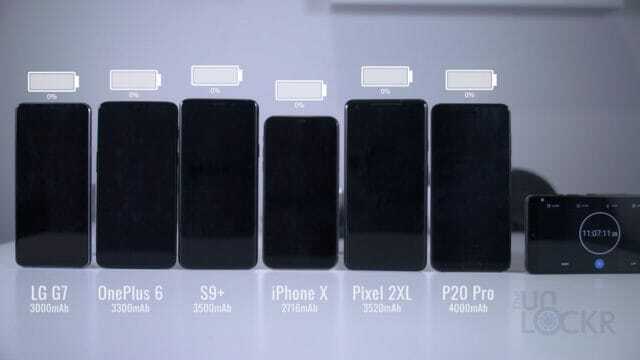 And then let’s quickly do 30 mins of 1080P video recording on all six devices. Not the most exciting video they’re recording but should still affect the battery the same regardless. At about 2 hours and 30 minutes into the test, the gaps are starting to widen a bit more (and I think we can say that my theory about the iPhone with Instagram is probably right at this point, but we’ll see if that pattern changes). 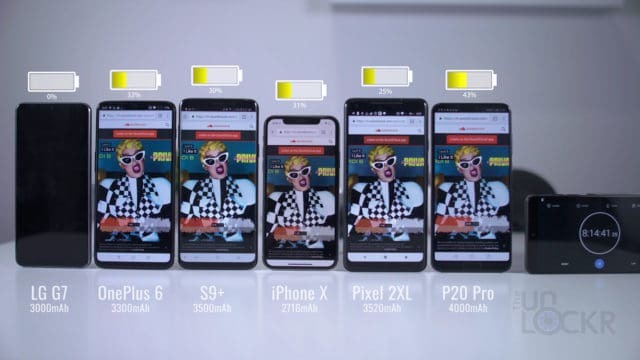 Now, at a little more than 2 hours of YouTube video streaming at 1080P in full screen on all the devices and 4 hours and 45 mins into the test, the G7 is starting to crash a bit, the Pixel 2 XL is next up, the majority are in the low 40’s and the P20 Pro is beginning to show off it’s 4000mAh battery, the largest compared to all the other devices by a decent margin. Then let’s try more social media, cause, let’s be real most people are probably using it a lot. This time, let’s use Facebook, and it’s auto-playing watch page (the thing that happens whenever you tap on any video, and it just forces you to look at other entirely not related videos). After that, I think the results are becoming pretty clear. 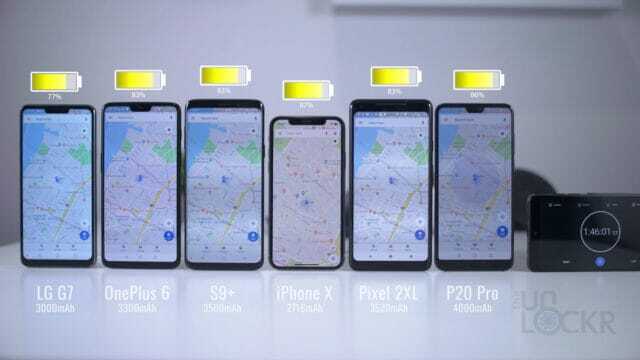 The G7 is on the last of its life at about 5%, the Pixel 2 XL is next at 25%, the OnePlus 6, S9 Plus, and iPhone X are neck and neck still around 30 or so, and the P20 Pro is at 43%. OK, music. Everyone plays music on their phones, right? Now, I can’t load my Spotify account on all six devices so let’s use Soundcloud (as it has an autoplay feature). 2 hours of that should do. And at about 6 hours and 45 minutes into our battery test, we have our first casualty: the LG G7. At 8 hours and 30 mins, all the other devices are still going. Now, because this test is taking way longer than I thought and it’s about 2 am right now let’s run YouTube for the rest of this and watch them fall. 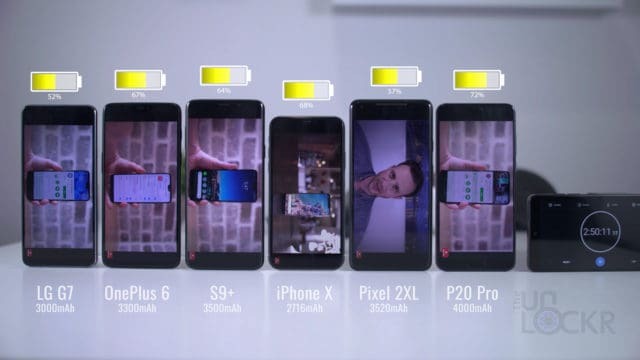 9 hours and 5 minutes in, the Pixel 2 XL goes down which isn’t that surprising because all the other devices besides the iPhone and Huawei are running the Snapdragon 845 vs. the 835 so they should be 30% more efficient power wise. 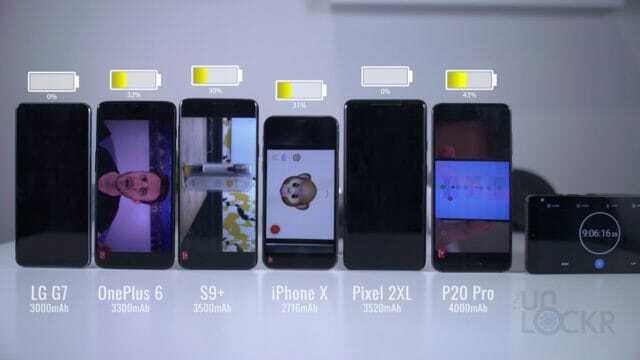 And the iPhone X, the phone with the smallest battery by the way, now dies at about 9 hours and 30 mins into the test. The S9 Plus dies just shy of 10 hours. The OnePlus 6 makes it to 10 hours and 40 mins impressively. 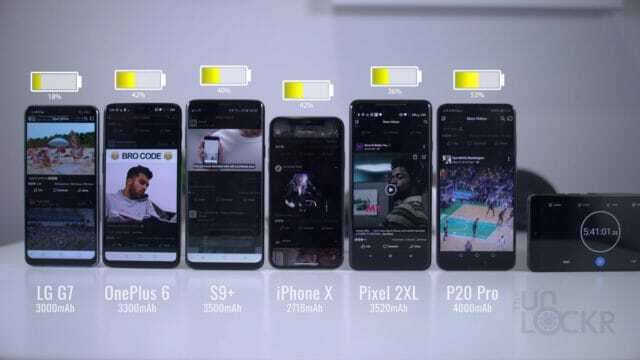 But it’s not enough to match the Huawei P20 Pro that makes it all the way to about 11 hours of screen on time. And there you go, the P20 Pro with it’s bigger battery and EMUI’s optimizations, wins pretty definitively, I think. And, yeah, it’s the one I thought would win. Huawei just puts giant batteries in their devices, keep the phones as slim as any of the others and the EMUI team has done an excellent job with handling that battery’s use. What do you guys think? What do you think of the results? Any suggestions to improve the test, let me know below!